We're happy to answer your questions anytime! However, please look through this list of most frequently asked questions to see if your answer is already here. What is the phone number to the Grimes Post Office? What streets can I park on when the snow ordinance is in effect? Does Grimes have a police department? Does Grimes allow open burning? How should I place my garbage or recycling cart to ensure collection during winter months? What should I do if my neighbor's dog is barking excessively? City Hall is open Monday through Friday from 8am until 5pm. City Hall is located at 101 NE Harvey St. Grimes, Iowa 50111. At the corner of 1st St (Hwy 44) and Harvey St. The Grimes City Council meets at 5:30pm on the 2nd and 4th Tuesday of each month. Meetings are held in the council chambers at City Hall, 101 NE Harvey St.
All Council meetings are open to the public, and there is a sign up sheet if you would like to address the Council during open forum. To start water service, go to our Utility Signup Page, or return this application (PDF) to City Hall at 101 NE Harvey Street at least one day prior to starting service. $100 deposit is required for renters. Garbage service for single family homes is included on the monthly water bill. The current rate is $9.93 per month. If you live in a town home or outside of the Grimes water service area, you will need to set up garbage with Waste Connections directly by calling 515-265-7374. The City of Grimes does not allow parking on any streets or alleys when the snow ordinance is in effect. The current fine for violating the snow ordinance (Grimes Code of Ordinances Chapter 69.11) is $50. 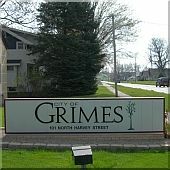 Grimes does not have a police department. Law enforcement is contracted through the Polk County Sheriffs Department. If you have an emergency dial 911. For non-emergencies call 515-286-3333. Open burning of yard waste and debris is not allowed. Open fires for cooking, heating, recreation and ceremonies are allowed, provided they comply with the limits for emission of visible air contaminants established by the State Department of Natural Resources (IAC, 567-23.2[3e]). For more information see Chapter 105.04 of the Grimes Code of Ordinances. Clear out a place for your cart when you shovel snow from your driveway. Leave 18 inches around it to allow room for the truck's arm. Don't place carts on snow piles, because it's easy for them to tip over and litter your streets and presents a difficult situation for the truck driver to set down your cart. Don't place carts in the street. This is a hazard for cars, and they could be destroyed by snow plows. If talking to the dog owner does not solve the problem, the next step is to call the Polk County non-emergency number, 515-286-3333. They will send a deputy out to document the problem and discuss it with the dog owner. Then a report will be sent to the City. If the problem persists then call Dave Sigler with the City of Grimes at 515-986-3036.